Quoyle: I used to imagine that I'd been given to the wrong family at birth, and that somewhere in the world my real people longed for me. From where my father stood, my failure to dog-paddle was only the first of many failures. Failure to speak clearly, failure to sit up straight, failure to make friends every time we moved to another dreary upstate town. In me, my father recognized a failed life. His own. Another moving display of human sentiments from Hallström. Lasse Hallström had created a number of great films that deliver serious introspective messages of human emotions, with masterful uses of filming locations and scenery to create the various moods of his films which is often pensive or thought-provoking. We have seen them in "Chocolat", "What's Eating Gilbert Grape?" and in "The Cider House Rules". His selection of novels he makes films based on is also brilliant. 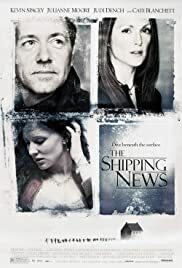 Here, "The Shipping News" is another master stroke from him which leaves the viewer quite in awe to the film's sentiments and atmosphere. I haven't read the novel. And it's quite unlikely I'll find it in my local bookstores and I hate e-books. So I can never judge the film's quality of adaptation. All I can say is that the film offers us a wonderful story of a rather ordinary man named Quoyal who's brilliantly portrayed by Kevin Spacey. The character of Quoyal is still fascinating, extra-ordinarily ordinary. The best chemistry of Quoyal is not with his later love-interest Wavey, but with his aunt Agnis. This is a major touch of brilliance in the story. The story also tells us about Newfoundland and its people... and leaves us indeed fascinated by those facts. But in the end, emotions are same everywhere, be it Newfoundland or Indonesia, so the story is ultimately of grief, sense of loss, rediscovering one's self and love. Julianne Moore is rather stiff in this film. I don't know whether it's for her role or she acted badly. 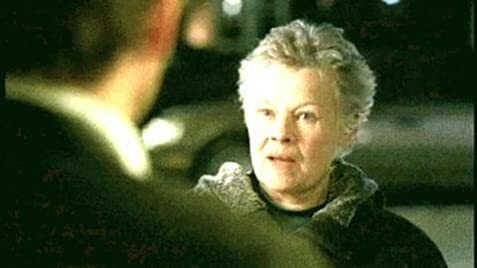 Judi Dench is a pleasure to watch again. Cate Blanchett's extended cameo is awesome too. But actors don't carry the film. The major credit for the film goes to the director. There's a major flaw (perhaps) in the story in the end concerning the character Jack but Hallstrom pulls it off nicely so that the audience cannot react to it and accepts it temporarily. Hats off to you, Mr Hallström.